The Chicago Bears finished the process of trimming their roster down to 75 players on Tuesday morning, and the decisions involved putting two players on the reserve/injured list. 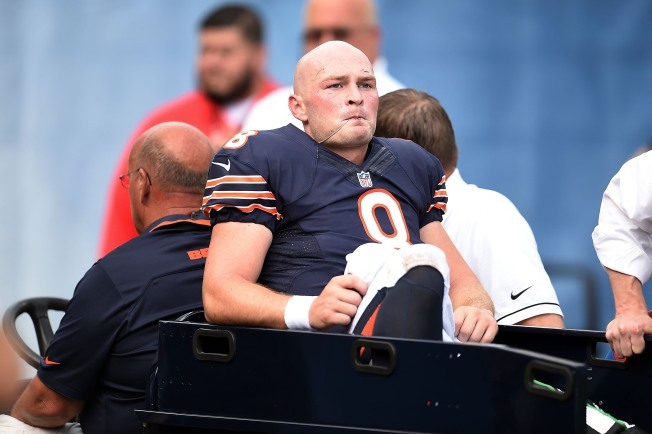 Those players are Hroniss Grasu, who tore his ACL during the Bears’ Family Day workout at Soldier Field in early August, and Connor Shaw, who broke his leg during the team’s exhibition loss to the Kansas City Chiefs on Saturday afternoon. Both players are done for the season thanks to their injuries, and the Bears made that designation official with their decisions on Tuesday. The Bears also made three other individual roster moves to get down to 75 players. Undrafted free agent Roy Robertson-Harris was placed on the reserve/non-football illness list by the Bears, and linebacker Lamin Barrow out of LSU was waived with an injury settlement. Finally, University of Notre Dame linebacker Jarrett Grace was waived by the Bears put their roster at 75 players ahead of their final preseason game against the Cleveland Browns on Thursday. One player not present in the roster moves was linebacker Pernell McPhee. The Bears will now have until Saturday to decide whether or not to place him on the Physically Unable to Perform list before the season starts, which would mean that he would miss at least the first six weeks of the regular season.